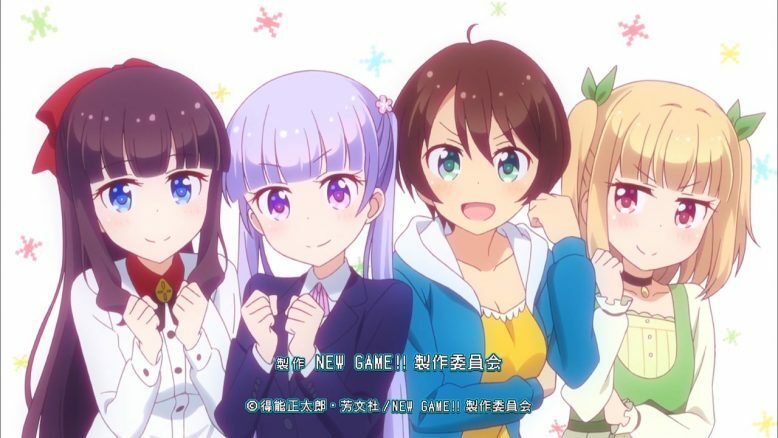 New Game!! has returned with an extra exclamation mark. I think it’s safe to say that this has been my most anticipated series of the season, given how much I enjoyed its strong first season a year ago. Cute women will once again make cute video games cutely, and I plan to go along for the ride. With Fairies Story 3 having been released at the end of season 1, it’s time for Eagle Jump to get back into it and begin producing another new game. 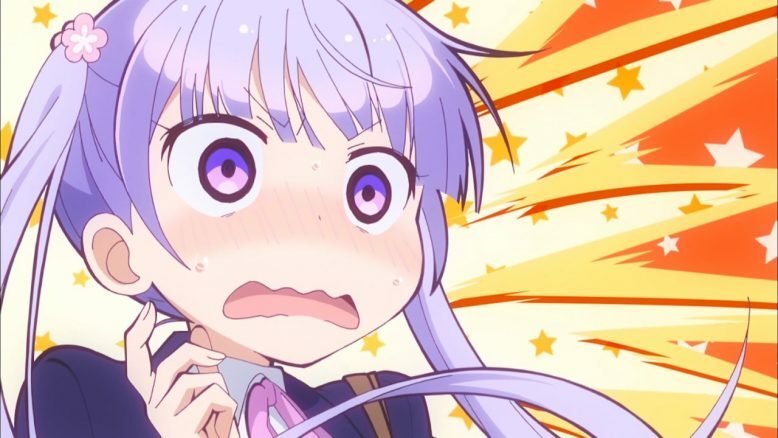 The episode begins with Aoba’s 1-year anniversary at Eagle Jump, and serves as a call back to her first day on the job: showing us how she has grown since then, and how she hasn’t. Certainly she rides the train, navigates the crowds, and walks the path to work with more confidence now. She’s been doing it for a year, so she knows she has nothing to be nervous about. Yet she stops outside the office again to psych herself up. Not about working there this time, but about meeting new employees who will be junior to her. Again she meets Rin out front, only to be told something shocking (they aren’t hiring anyone new this year) and be thrown off her game. It’s the little change, once they get inside, that I like the best, personally. 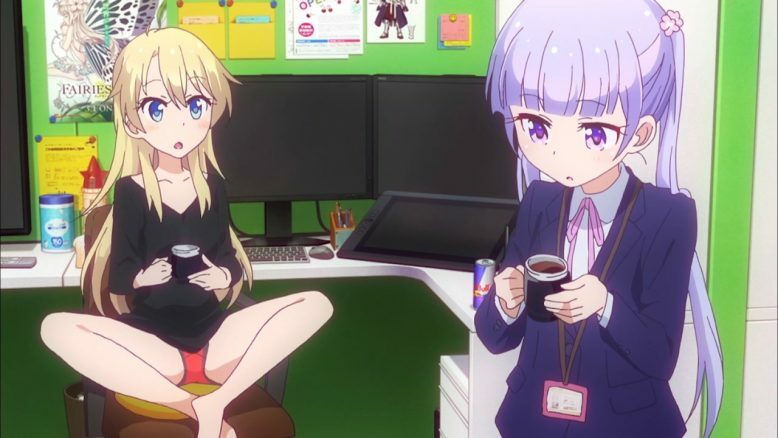 Aoba doesn’t try to drink her coffee black any more. She’s realized that she doesn’t have to try to impress anyone with what she drinks. That, at least when it comes to this, she doesn’t have to prove herself to anyone. Rather than try to push herself to look more adult by drinking something unpleasant, she’s accepted that she can simply drink what she likes. Which, as Ko says, is a much better sign of maturity than any attempt to fake it. Nene and Umiko’s little date is a favorite chapter among many readers of the manga, and it’s really good to see it animated here. The two of them are such an odd pair, yet they play off each other well. Although Nene’s ten years too early to try the sniper approach against a master airsoft player like Umiko. 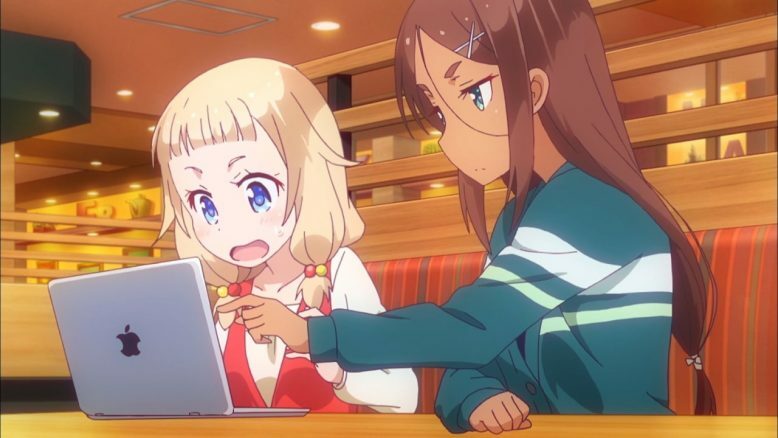 It’s cute to see them still getting together even though Nene’s time at Eagle Jump is over, and seeing how Nene has been influenced to learn programming is pretty cool. Given that this chapter was initially set before the new year in the manga (the adaptation has played with timelines in order to have the call backs to the first episode from season one that I mentioned above show up in the first episode of this season) Nene learned enough about programming to write a game using her own engine and everything in the space of maybe two months, at most. That shows some dedication on her part. More than I ever managed: I gave up on programming in college. After a certain point it just suddenly all became gibberish to me. Nene, all by herself, has created a game that runs. Bugs or no, she’s put effort into this, and it feels like a good step for her. I am eager to see where she goes from here. There are some points of interest from the evaluation interviews. 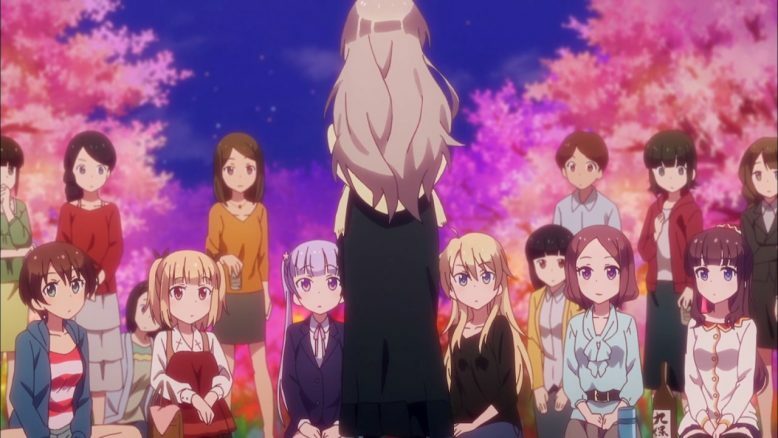 Leaving aside the question of why there are only girls in their department (Hazuki likes having cute girls around so she only brings girls into her groups) there’s the issue of needing a leader for the character team. 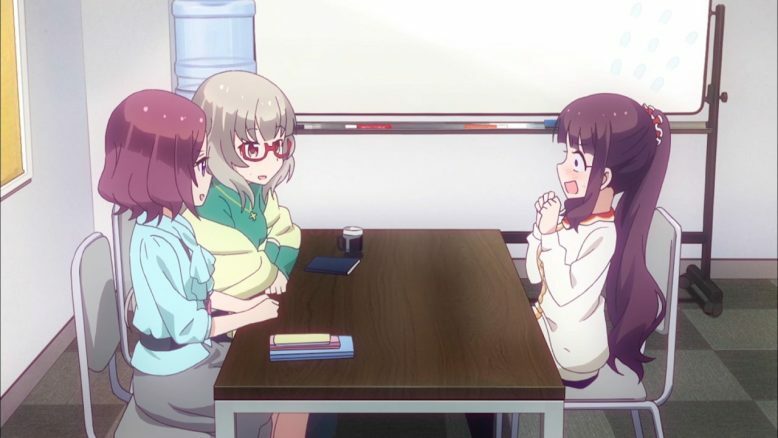 With Ko moving up to Art Director, Hifumi is the most senior member of the team, but she is currently terrified at the idea of assuming that sort of role. Both Aoba and Yun aren’t really suited to lead the team yet: they need more experience. While Ko can keep handling the position, it would be better for her and for the others to let one of the younger girls do it. Yun’s evaluation is also worth noting. She is seeing people around her working towards accomplishing their dreams in life, and she’s finding her self-confidence wavering. She doesn’t know what her dream in life is. She just sort of went with the flow of things and ended up at this job. She’s good at it, and she enjoys it, but is it what she always wanted to do? She doesn’t know. She wonders if she should be out there searching for her own goal in life instead of staying here where it’s comfortable. She wonders if she really belongs here with these people who have this sort of passion for their work, when she doesn’t really share it. These can be hard questions, and I don’t think there are really any perfect answers to them, but I do believe it would be foolish to abandon something she is good at and enjoys doing just to try to find some unknown vocation that she might suddenly discover a passion for. Certainly she can keep looking for something she wants to do even more than what she is doing now, but until she finds such a thing it is by far wiser to stay where she is. Certainly no one wants her to leave. She’s a delight. The announcement for the character competition is the last major point in the episode. This is something big. I honestly don’t know how common something like this is, but this is a chance for everyone in the company to attempt to influence the design of the new game. While the members of the character team certainly have the best shot at winning (they’re the people with the most training and experience at making art for things like this, after all) I believe the fact that anyone can participate helps give a feeling of agency to the rest of the company. After all, even if they participate but aren’t chosen, Hazuki will still have seen their designs, and the chance exists that it will give her ideas for something to put in the game down the road. Right now, of course, this is the biggest deal for Aoba. 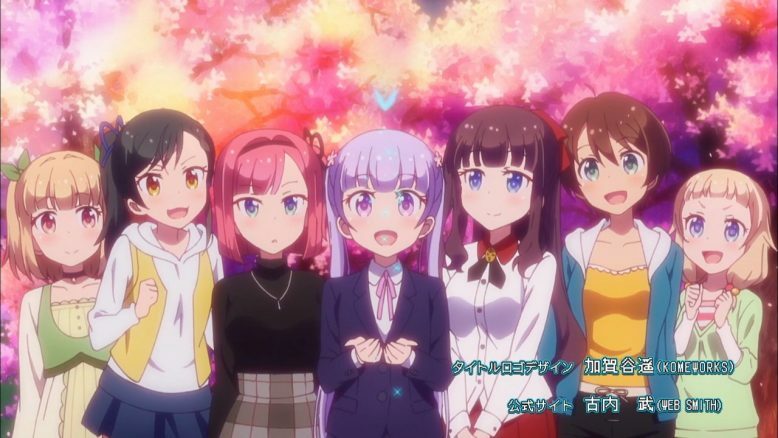 As the only other member of the character team besides Ko who focuses on actual character design (Hifumi’s been specializing in 3D work, and Yun tends to focus on monster art) this is Aoba’s chance to show what she can do. 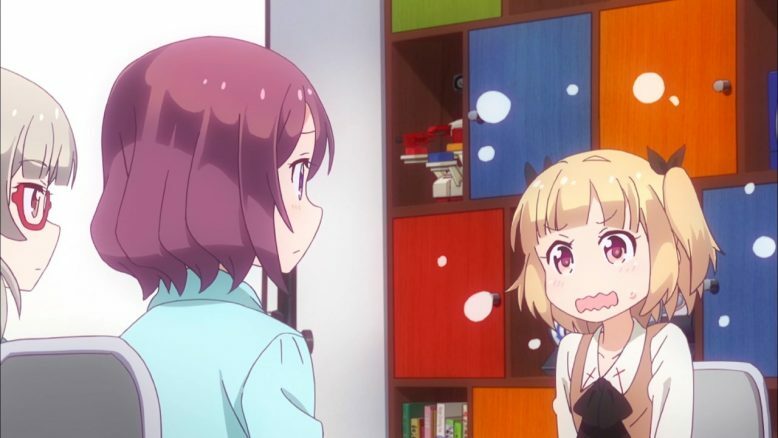 Of course, that means she has to draw something that catches Hazuki’s attention more than the undoubtedly very skillful drawings that Ko is going to produce. It’s great to see this series back again, although it’s hard for me to believe that an entire year has passed since the first season aired. 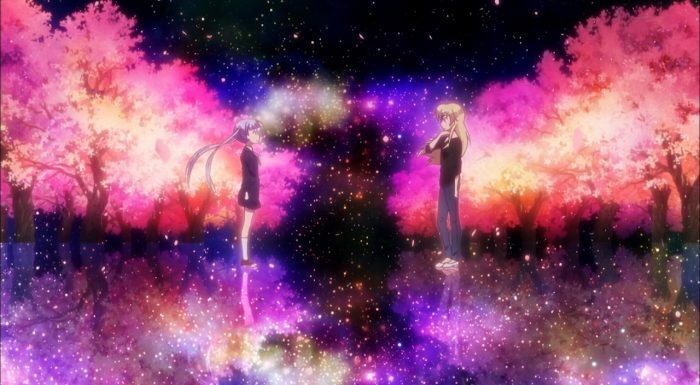 Season one became one of my favorites thanks to Doga Kobo’s skill and bringing the manga to life on the screen, and I’m confident they’ll do a similarly good job this time as well. This season promises to be interesting, not just thanks to the usual that we can expect, but also as the OP reveals we’ll be getting two new characters: characters who haven’t even been introduced yet in the translated chapters of the manga (although I have seen pictures of them in an artbook for the series). I know next to nothing about them, and I don’t know how the story will proceed when they appear. I am really looking forward to this, and I hope you all are going to be along for the ride.